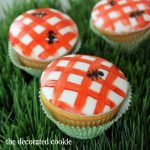 “Strawberry patch”cupcakes are an adorable summer treat idea. Despite the fact I’ve subscribed to Better Homes and Gardens for almost 15 years now, I’m a terrible, terrible gardener. (I get the magazine for the home and food sections, and skip right over the middle.) I certainly wish I had extensive gardening knowledge, but seeing as how plants wilt and wither when I walk by, I couldn’t in good conscience cause that kind of damage to the great outdoors. So when I buy flower pots, it’s not to garden. It’s to serve cupcakes. Yes. There are cupcakes in those flower pots up there. 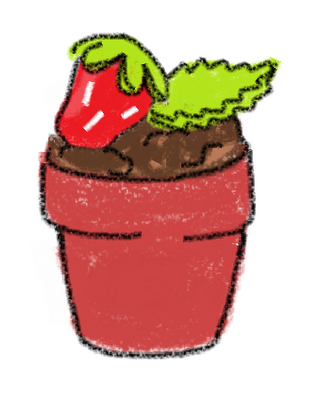 I don’t even know if you can grow strawberries in a flower pot. Probably not. 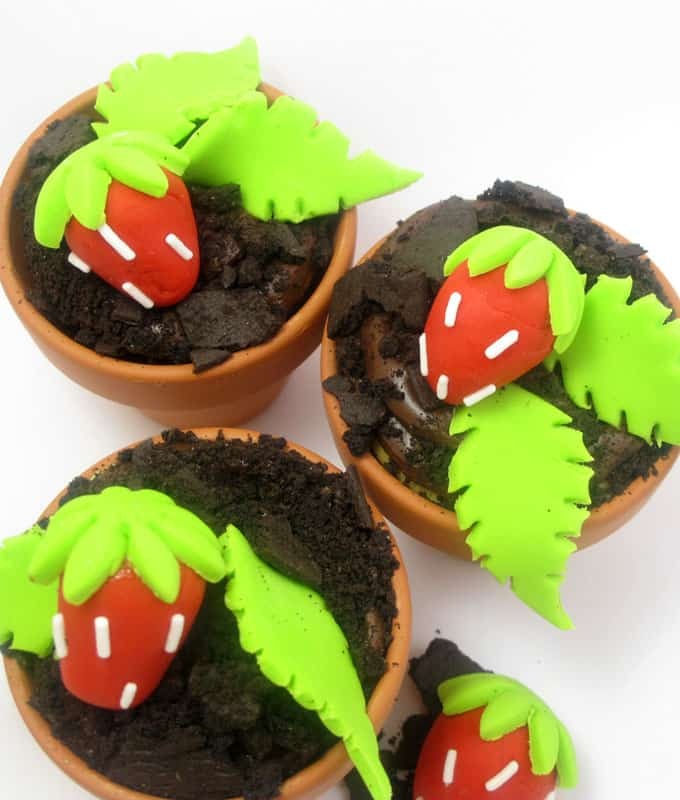 Oh well… Here are some strawberry patch cupcakes. If you need more summer treat ideas, click here. 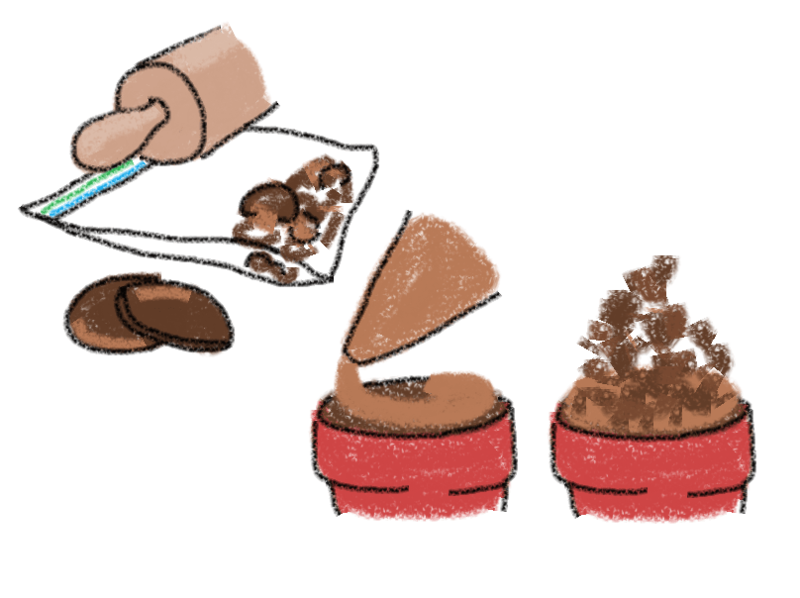 *Find the flower pots, decorating bag, sprinkles (I have the rainbow mix and picked out the white sprinkles), fondant, and fondant cutters in the craft store. The flower pots are 2 1/2 inches tall with a 2 1/2 inch diameter at the top. For food coloring, I used Americolor soft gel paste, Electric Green and Red Red. For tips on finding cookie decorating supplies, click HERE. To save some tedium, you may omit the white sprinkles and make indents in the strawberries with a toothpick. Find chocolate wafers in the supermarket. You’ll find premade, white rolled fondant in the craft store, or make your own marshmallow fondant HERE. 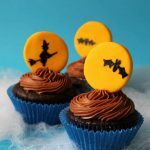 Prepare cupcakes with your favorite recipe or store-bought cake mix. Let cool and place in the flower pots. Place chocolate wafers in a sealable bag and crush with a rolling pin. Prepare chocolate buttercream frosting (or use store-bought). Fill the decorating bag with chocolate frosting, snip about 1/2-inch from the tip, and pipe frosting on a cupcake. Immediately coat the top with the crushed wafers. Repeat with all the cupcakes. Prepare fondant or use store-bought. Take two chunks of fondant, add a few drops of food coloring and knead well. You’ll need green and red fondant. TIP: If the fondant gets sticky from overhandling, let sit at room temperature uncovered for 15 minutes until easily pliable, and use confectioner’s sugar as needed to prevent sticking. To make the leaves,roll out green fondant on a surface dusted with confectioner’s sugar. 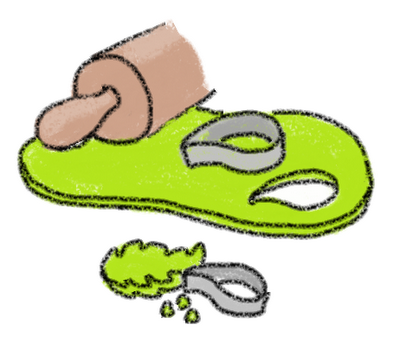 Cut out leaves, then make divots in the edges using the tip of the leaf cutter. Set aside. 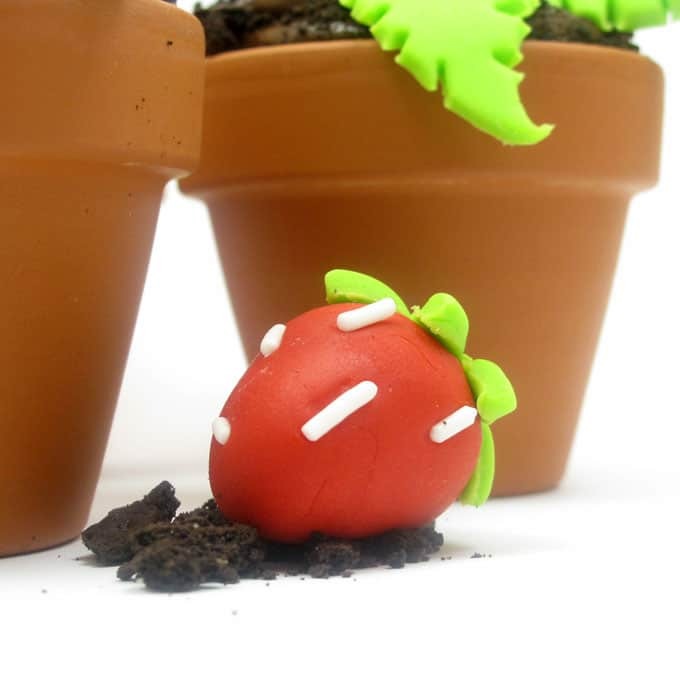 To make the strawberries, roll a ball of red fondant about 1-inch in diameter. 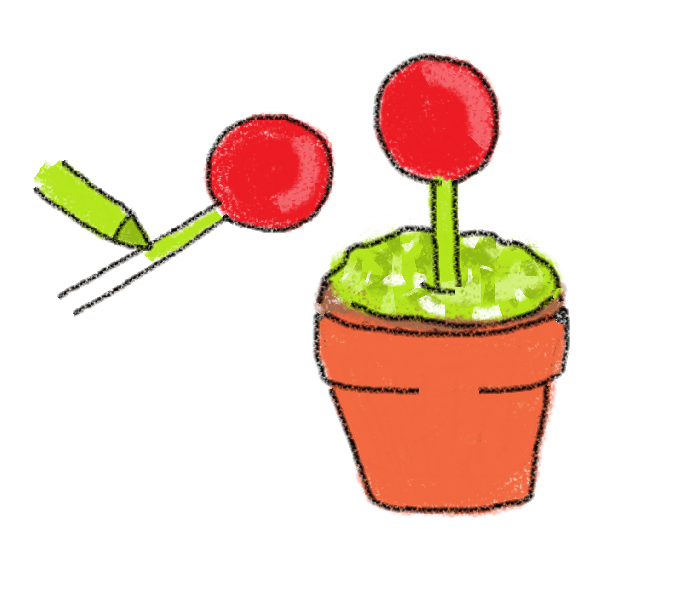 Pinch it into a strawberry shape (flatten one end, then roll the other end between your thumb and forefinger a bit.) 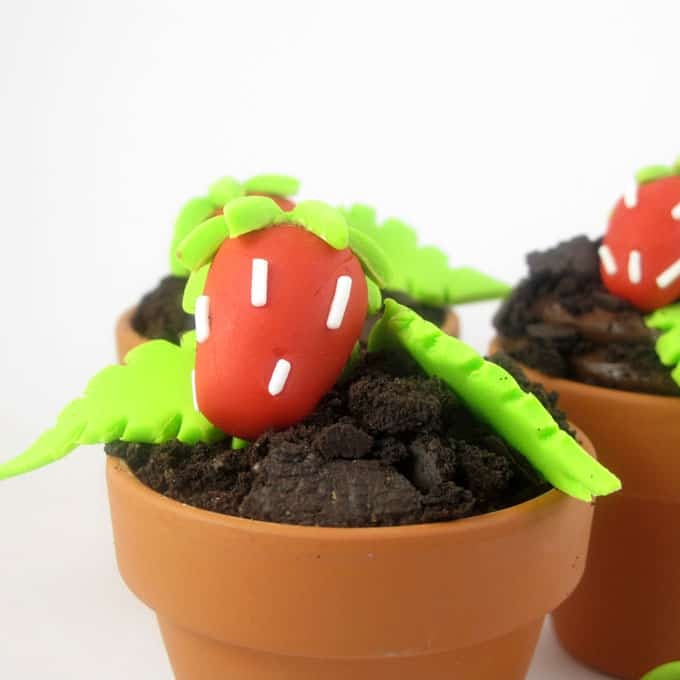 Roll out green fondant, cut out a daisy shape, dab light corn syrup on the flat end of the strawberry, and adhere the green daisy to the top. 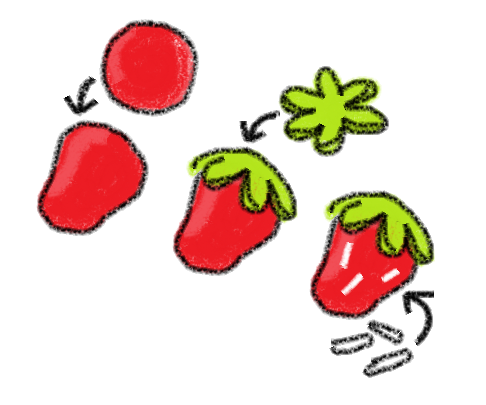 Impress white sprinkles in the side of the strawberry, using a dab of water as necessary to adhere. TIP: Instead of sprinkles, just make dots with a toothpick. Arrange the leaves and strawberries on the chocolate icing. These looks so so so cute!!! So cute! 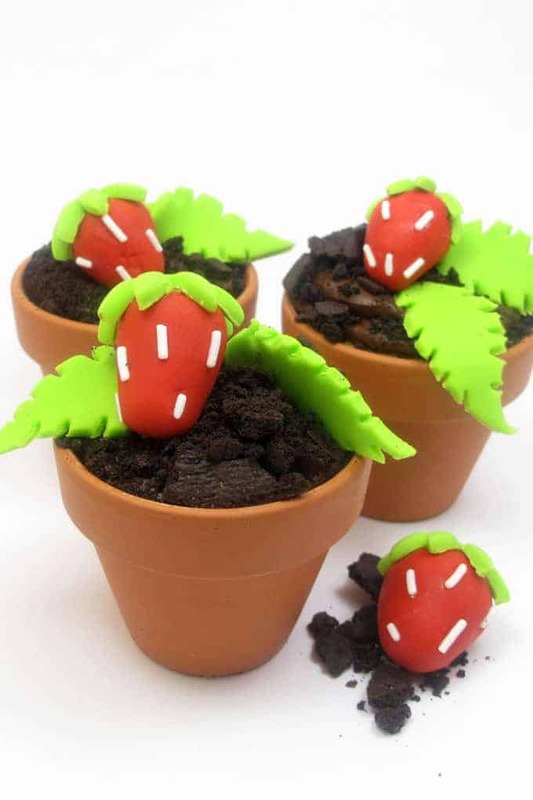 And you can grow strawberries in pots… lol but why worry about that when these are so adorable! This one reminds of Audrey II from Little Shop of Horrors and if you can make her look even more like Audrey II, that would be so freaking awesome! 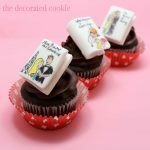 These are absolutely precious – Brilliant Meaghan! This might be my favorite yet. I dont see how you never run out of ideas! Wonderful idea! I'd love to see a giant strawberry themed wedding cake with these little strawberries scattered about as edible decorations. These strawberry cupcakes are so adorable! I can think of so many people who would love these – gardeners, kids, Moms. 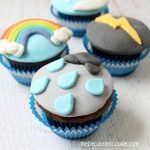 I've never used fondant (too much of a wimp), but I might have a go after seeing these. TOO CUTE!!! Love the idea and the execution! Wow these are amazing, who would of thought you could do this!